It's Pub Night: How Good Is Deschutes? 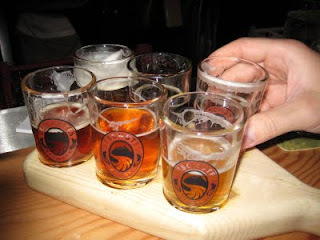 Last week the Pennsylvania-based beer writer Lew Bryson posted a review of Deschutes Hop Trip on his blog. He was underwhelmed by what I consider to be one of the better fresh-hop ales each year, finding the fresh hop flavor to be too subtle. No big deal, everyone has different tastes, and I certainly wouldn't claim to have the most refined palate on the Internet. What was surprising was the thread of comments following his post, where a few commenters had some really harsh words for Deschutes. It started off with a fellow from our own neighborhood, who said the brewery is a shadow of its former greatness. Another commenter opined that the brewery is now merely competent although it was once great; someone else went so far as to compare Deschutes to Miller High Life. I only moved to Oregon six years ago, so I don't have the history that some of the Deschutes detractors have. The "shadow of former greatness" commenter has fond memories of John Harris' tenure at Deschutes, and finds everything since that time to be boring. The "High Life" comment guy thinks Deschutes gutted their beers in 2003 -- the year I moved here, what luck. I don't doubt that John did a great job there, just like he's doing at Full Sail's Riverplace brewery right now. Heck, I bet Hammerhead tasted better when John was the first McMenamin's brewer, too. But surely some good things have come out of Deschutes since the good ol' days, right? What about the superstar imperial stout, the Abyss? The Abyss is so highly prized that I was able to sell my empty Abyss bottle on Ebay last year for $15. Some of their other big beers are anything but boring: Mirror Mirror, Double Black Butte, Hop Henge, and -- for you sour beer sickos out there -- the Dissident. Big beers in wax-sealed bottles are one thing, but the everyday supermarket beers from Deschutes are also at the head of their class. Inversion IPA has become my default six-pack. Black Butte and Mirror Pond may not be revolutionary, but you can pretty much count on any guest at your house -- beer expert or novice -- being able to enjoy one of them. So I was also shocked by another recent symptom of Deschutes Backlash: when the Beermongers opened last month, they didn't stock a single beer from Deschutes, despite carrying industrial brews like Coors, Bud, and Miller. Ouch! Jubel Ale, a rich, creamy, roasty winter ale is on the shelves --and taps -- now. That first winter I lived in Portland, my neighbor Dave did a little dance when that year's Jubel came out, and the two of us got a little carried away, chasing from pub to pub in the rain on rumors that the Horse Brass or Rose and Raindrop had Jubel on cask. I still have a couple bottles of 2003 Jubel in the basement. Chasing down cask Jubel is no longer much of a problem, now that there's a Deschutes pub here in Portland. As Derek pointed out not long ago, the pub always has several creative beers on tap in addition to the usual Deschutes lineup. Since it's fresh-hop season, I highly recommend the fresh-hopped Mirror Pond that's been pouring there. An amazing beer, one you'll remember for years. If it's on, the fresh-hopped Hop Henge is also a stunner. So if Hop Trip or Black Butte -- or even the Abyss -- doesn't grab you, fine. But look at the range of beers put out by Deschutes, the awesome one-offs in the pubs in Portland and Bend, and the ability to produce mass quantities of high-quality supermarket six-packs. What's not to like about all that? Those pieces weren't all in place 10 years ago, so how could this be a brewery in decline? Nicely said. Deschutes is still a great brewery with a wide range of top shelf offerings. As a historical note, Deschutes did lose its way, briefly. I think the commenter who noted that the switch from Bachelor Bitter to Bachelor ESB was a debacle. It was. During that period, the brewery had a different brewer and the beers were not distinguished. Quail Springs IPA was a dud, too. The brewery wasn't doing anything creative, and it was a period of low interest. It's worth noting that Deschutes has always been ahead of the curve. In the early 90s, they put a big bet on two black beers, just at the moment Widmer Hef was at its peak of popularity. No one thought you could sell porters and stouts in this market. The time and investment they've put into beer development for their specialty products looks like a money mint now, but if that's the case, why didn't Pyramid, Redhook, and MacTarnahan's come to the same conclusions 5 years ago? Jeez, I should post this on my own blog. Thanks for the historical perspective, Jeff. Since I apparently arrived here during a lull, from my perspective it looks like Deschutes just keeps getting better. Since you mentioned Larry Sidor, I have to point out that Margaret did a very nice interview of him on Brewpublic: part 1 and part 2. Deschutes received quite the props from Men's Health in this article: http://www.mensjournal.com/top-five-beer-towns. The comments are an interested read about number of brewpubs in Portland vs San Diego. Completely agree with your view of Deschutes. While I don't drink their standard lineup all that much, I think it is quite solid. When you throw in their special releases, I think they are a great model for a brewery their size. Sounds like you had a good time here, Geoff. I love fresh hop season. You mentioned Iron Horse in your article (though not 100% positive on it). Any notable Washington fresh-hop beers this year? Sadly, I have not have a single WA fresh hop beer yet this year. Snipes Mountain's Harvest Ale won first place at the Yakima Fresh Hop Ale Fest, so I hope I see that one around here. Geoff: The only WA one I've had is the Walking Man Fresh Hop, it was mighty tasty, definitely extremely hoppy, but keeping some of the fresh flavor. It's the world we live in, and every one of them has an opinion. Mine; Deschutes is a nice brewery. I do enjoy their beers. And I enjoy them often. However, I think that they are playing it safe lately. They are that brewery that you tell your Bud drinking friends to try. They are a safe pick. They are entering that session beer arena. With that said, they still are the best company to work for. Damn I wish I could wok there. And I really love some of their special beers like Lips of Faith "La Folie" and "Biere De Mars". But they aren't for everyone. In the end, I am a fan. Much of the criticism is un warranted. Lips of Faith and Biere de Mars are from New Belgium, not Deschutes. Which is another big good brewery, but not as good as Deschutes :-).